Home / Politics / PETA: Check this out! Apparently President Obama swatted a fly that was bothering him during an interview, from what I understand it was a fairly impressive strike as well. Anyway, PETA called the swatting of the fly an 'execution' and wants the President to be more sympathetic. Seriously? PETA, you think that's bad? Check this out. Lately we've had a bit of an issue with there being to many flies in the kitchen (an unnamed roommate tends to leave the patio door open). I tried shooing the flies outside but they were not having it, so I resorted to 'Plan B'. 'Plan B' consisted of using my deluxe red fly swatter with 'mercy hole' (a fly shaped hole in the middle of the swatter) to dominate as many flies as possible. As I created corpses, I placed them not in the trash or compost, but rather I decided to display them in the sink for the remaining flies to see. My plan worked perfectly and within only a few days, the remaining flies vacated the premises and were never seen or heard from again. Peace was restored to my home and my family rejoiced! 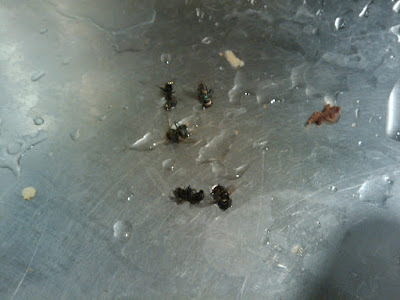 I then took all the little fly bodies out of the sink and fed them to my dogs, cause thats how it works in nature. Eww - did you really feed our dogs dead flies from the sink? Gross.